Climbing toys are often used for kids with plenty of energy. They are a creative way of playing. The best climbing toys for kid and toddlers can also ensure they are far from time-consuming gadgets and playing in a way in which they can harness all their energy. Most of these toys can also be shared with friends or siblings. Climbing toys also represent a social opportunity for more kids. Most importantly, climbing toys are fun. The best climbing toys for kids and toddlers are often all that’s needed to enjoy play time. Why we like it: With mini stairs and a small slide, this fun playset can be used both indoors and outdoors. Including multiple functions, the Activity Center Playset is one of the most versatile climbing toys for kids up to 45lbs. To climb to the top of the slide, kids can use the miniature stairs which don’t require too much effort. Scooting down the miniature slide is fun and safe for most kids. But there other added features which might make playset a more versatile toy. With an included miniature basketball hoop, kids and toddlers can start to learn the first steps of the game. The left side of the playset features a baseball activity corner. A tethered baseball allows kids to play without having to run for the ball all over the house. Practically, the playset is a 3-in-1 toy which can be used for daily fun. Why we like it: Combining creativity with fun, the Jumbo blocks are a top choice for kids 2 to 5. 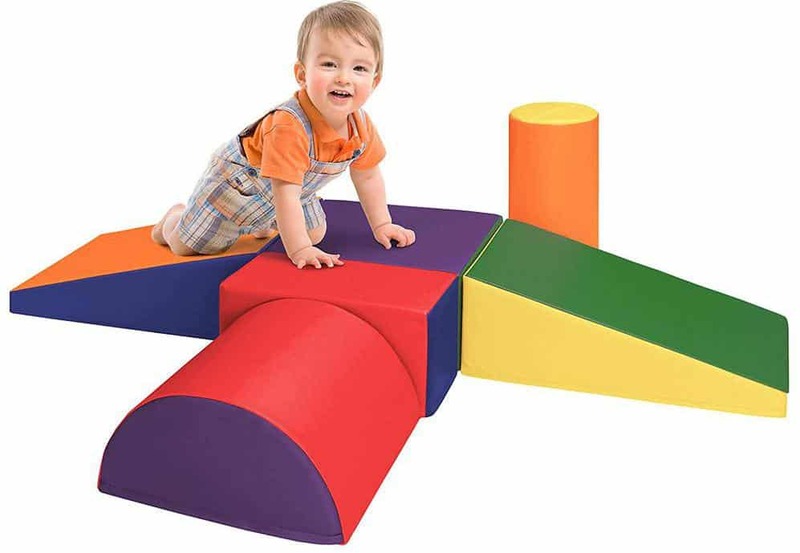 Offering 40 blocks of 3 sizes and different colors, the set is a top choice when it comes to climbing toys. It allows kids to climb boxes and create their own fun play areas. 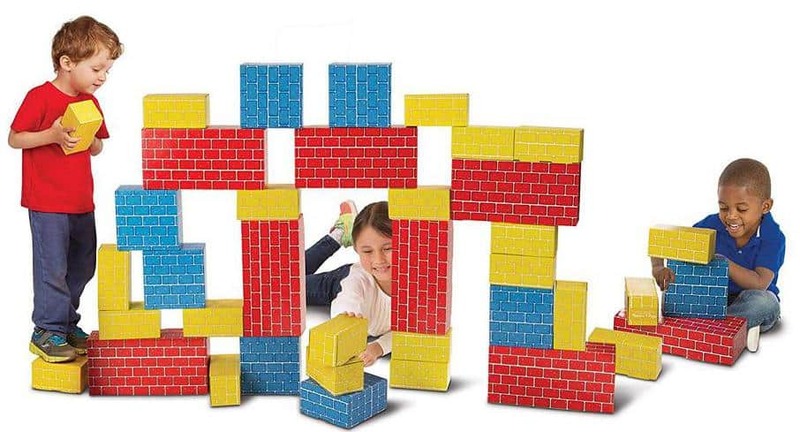 From castles and forts to walls and towers, kids can use the Jumbo blocks to play on their own, with friends and even with their parents. Since the colorful building blocks come in different sizes, they are a great solution to boost creativity. Even if the blocks are used to boost physical activity, they also require a small degree of creativity and planning. Kids can develop the organizational and social skills playing with the blocks. One of the best parts of the playset is that it can easily be combined with other toys. From arches to binoculars and playing various games, the cardboard boxed can be used for many of the kids’ favorite games. Why we like it: Simply using plastic pipes, the climbing tower can quickly become the next outdoor kids’ attraction. Not many parents can claim that pipes are fun. But Eezy Peezy comes to prove that they can be fun. Simply using plastic pipes and connectors, parents can create a strong climbing tower which allows kids to have hours and hours of fun out in the sun. The best part is that the materials of the tower are known for their durability. Unlike many other toys, the materials are actually made with UV protection. It is why even when left outside in the summer sun, the pipes will remain as strong and as durable as they are intended to be. Since the pipes are connected with simple plastic connectors, they can also be assembled inside the house when the weather is not the best for kids to enjoy climbing fun. Using interlocking tubes and self-locking connectors, the tower can be assembled in minutes. Why we like it: This comprehensive toy is one of the larger options to ensure kids put their energy playing into various sports and exercises. 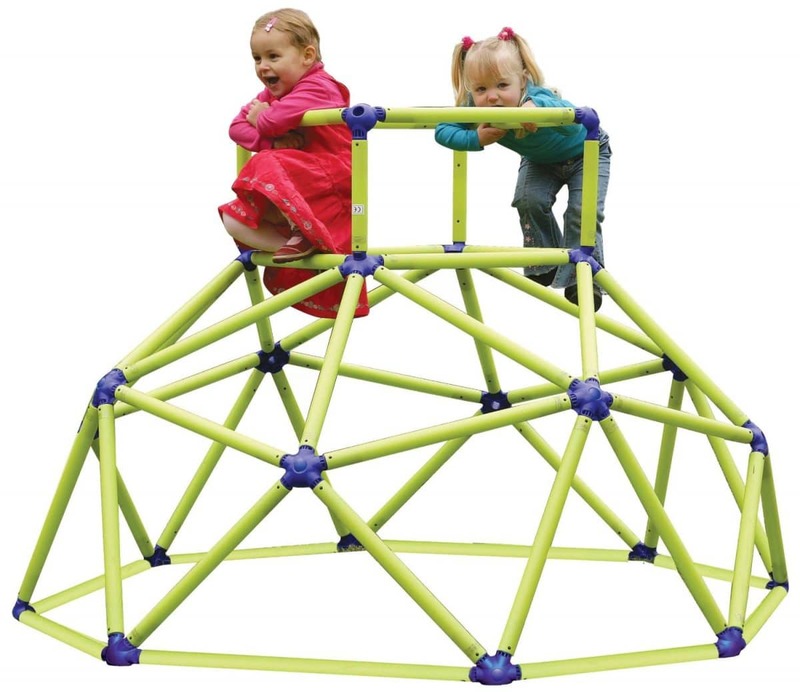 As one of the larger toys to consider, the 5-piece structure is perfect both indoors and outdoors. Circuit playing is favored by its design. 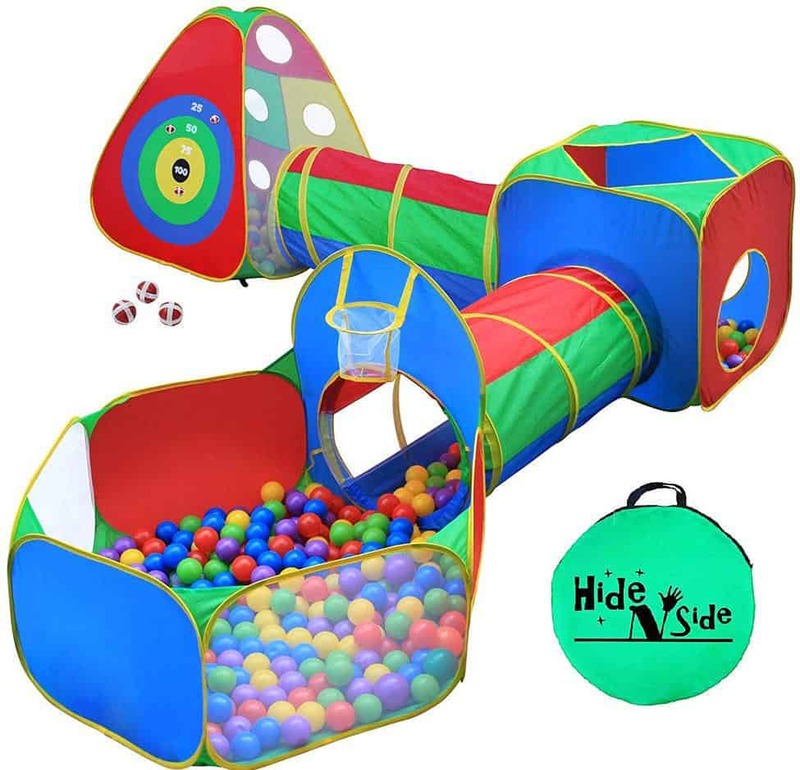 Starting from a distinct tent, kids can move on and crawl through a tunnel to a first pit stop before making their way to the house of balls which even includes a basketball hoop. 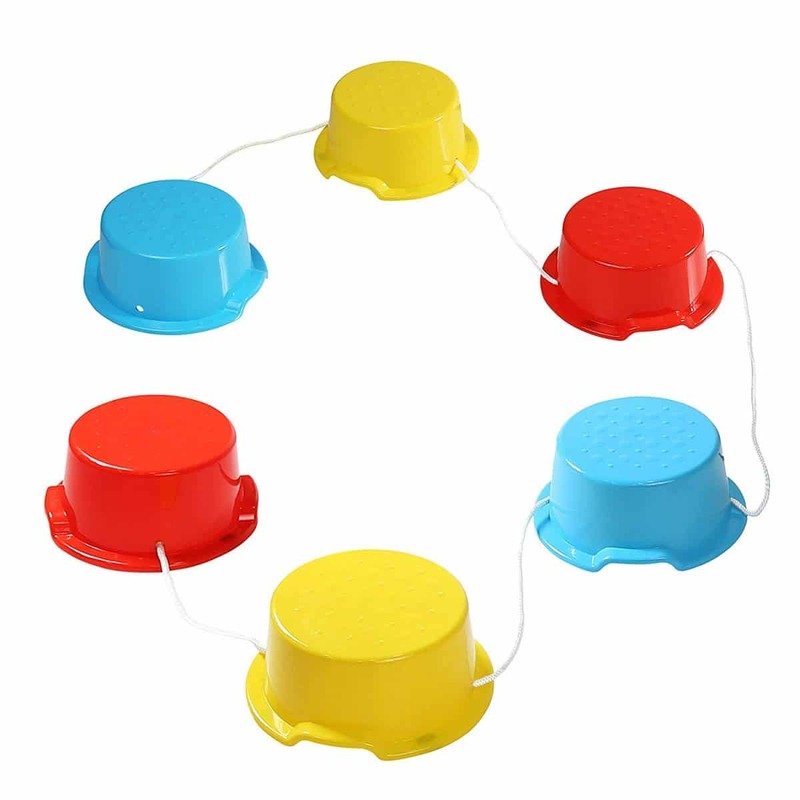 A sticky darts game is also added on the tepee-style tent which uses sticky balls instead of darts. One of the most important characteristics of the structure is that it actually forces the development of locomotor skills. Processing disorders, ADHD or developmental issues can be tackled with such toys. But even kids with no such health issues can make the most of the construction which allows them to play on their own or set new lap times with their best friends. Another important consideration comes with the folding design of the structure. Kids can actually enjoy their fun time and parents can store the construction away before the next play session. With materials which are also easy to clean using wet wipes, parents shouldn’t worry about the cleanliness of the pit tents and tunnels too much. Why we like it: This wooden aid is one of the climb toys which is useful to share adult activities with children. Cooking time can often be a time when adults are separated from children. But most kids are actually missing out when it comes to food making. Even seeing adults prepare meals can make kids appreciate these meals better. At the same time, adults can also teach their kids about the importance of sharing meals and what goes on behind the scenes where meals are made. But most kids can’t actually reach the kitchen counter to see meal preparation steps. 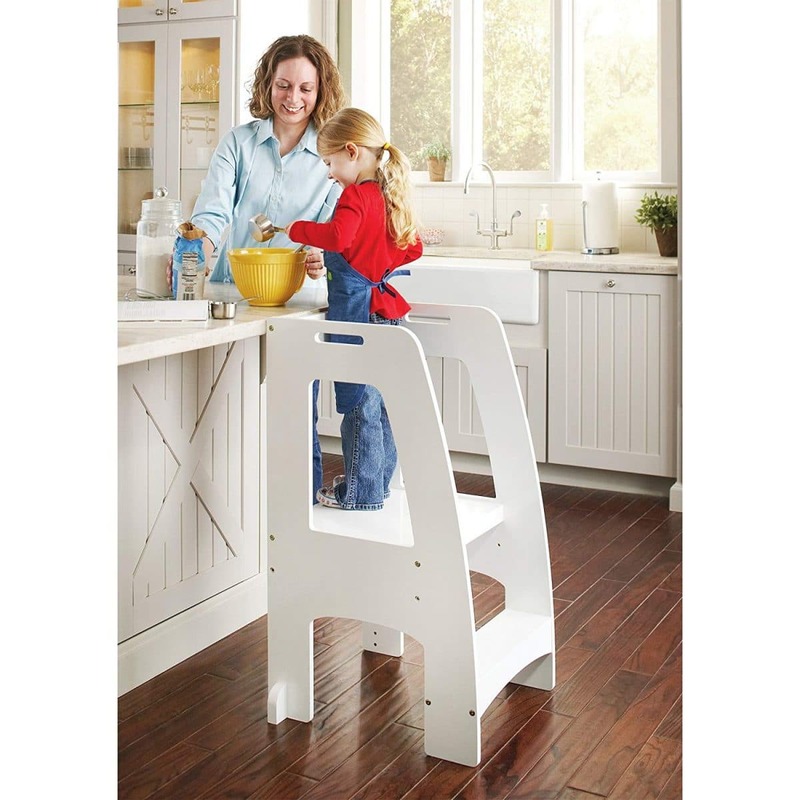 The Kitchen Helper Tower Step-Up is the perfect durable solution for this purpose. With a wooden structure, it even comes with safety rails to make climbing easier for kids. The platform also adjusts for two heights so that kids can easily reach their kitchen’s counter. With an elegant design, the Tower Step-up also fits most modern kitchens without making parents worry about the overall design of the cooking area. Why we like it: With a 45cm height opening, the Caterpillar Tunnel is a preferred toy for active playtime. Many parents want to get their 2 to 4-year-olds’ to start playing more to develop their motor abilities. The Peek-A-boo Caterpillar offers one of the designs which can make this happen. There is a large-enough tunnel opening to allow kids to crawl through it with confidence. At the same time, kids can take full advantage of their tunnel by setting new records in circuit play. Made with bright colors, this play tunnel is attractive for most kids. Luckily, its chosen materials and colors are durable as well. So even if it’s used in the school’s playground or in the backyard at home, it won’t get damaged due to UV exposure. Climbing and crawling skills are tested by the tunnel. Kids up to the age of 4 can also climb it to have their fun alone or with friends. 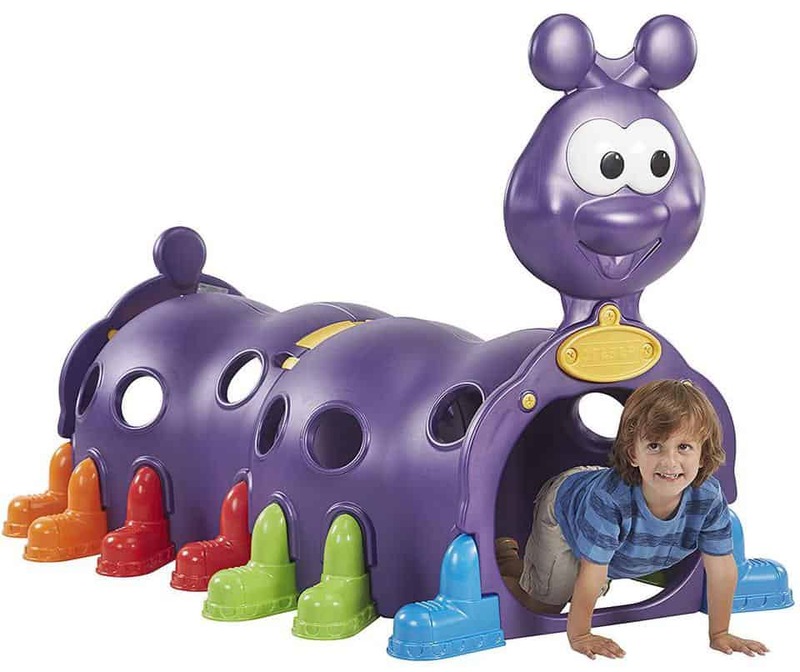 Designed with windows for peeking and with rainbow stability feet, the Caterpillar tunnel is both safe and attractive. Why we like it: Navigating to the Caribbean Islands may not be needed by kids who want to be real pirates as they can have their own boat at home. 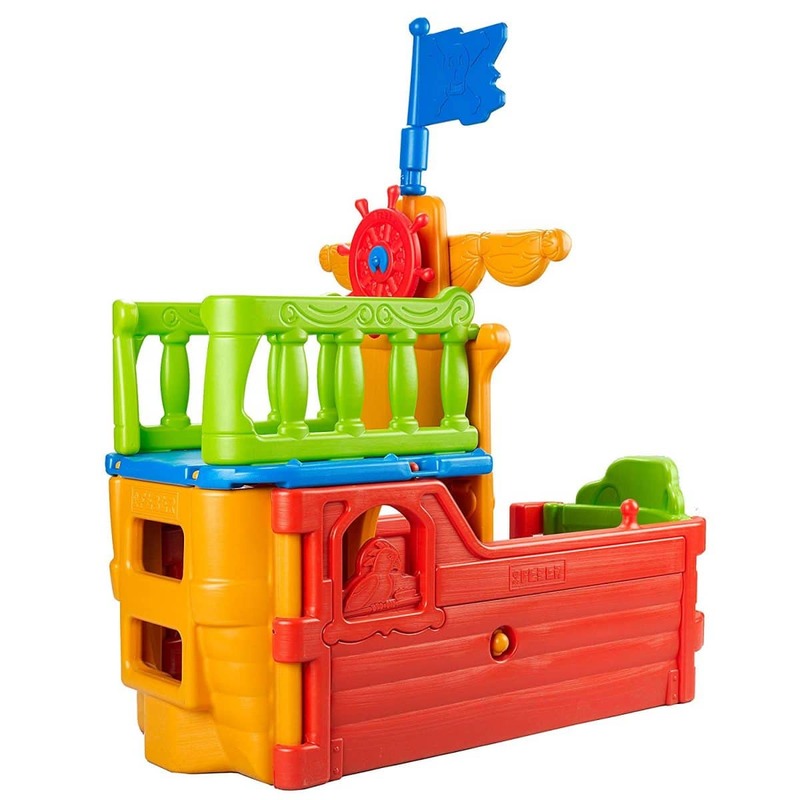 With a simple and durable design, this climbing toy is perfect for kids who want to become pirates. It represents one of the most interesting simple toys with impressive results in terms of imagination. For this purpose, it can even be one of the most interesting choices when it comes to playing time or themed parties with friends. So which kids can play in the boat? All kids need to be at least 2 to climb the boat. But even those up to 6 years old can make the most of the pirate-themed boat. Since it is made from plastic panels, the boat is also easy to clean. But even if left outside in direct sunlight or in the rain, the boat will still maintain its integrity. During the winter months, the pirate boat can accost inside the house. Why we like it: With a simple design, the wagon provides hours of fun for kids and their friends. 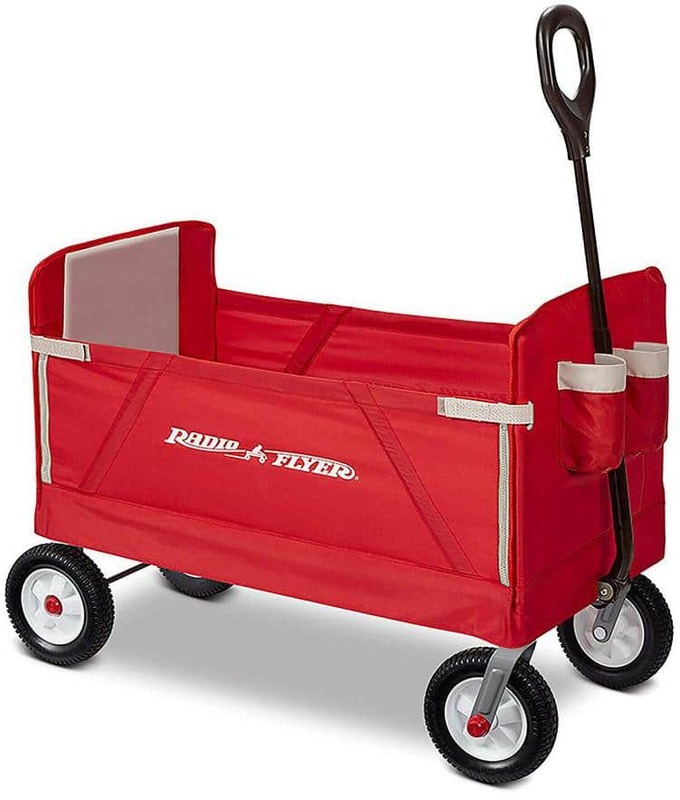 A simple wagon can prove to be the best toys for many kids at times. Even without complicated cartoon characters, it can still spark hours of fun for the little ones. With a versatility which allows up to two kids to seat in the wagon, it can be a top choice for brothers and sisters. Made with a versatile design, the wagon can actually serve for hauling, two-rider seating or simply as bench seating. It also comes with two cup holders which ensure kids stay hydrated through the day. Most importantly, it comes with large wheels to take the kids over various uneven terrains. Its folding design allows the wagon to transform into a simple bench. But many parents ask when would this wagon be suited to be used as a bench? Simply having the kids sit in the wagon while they are read stories during the summer nights can be an example when the wagon can serve as a regular bench. Why we like it: As one of the ultimate climbing toys, the Skyward Summit tests kids’ will and energy. Made with junior grips and a cargo net, the climber toy facilitates kids’ effort to get to the top. With a climber platform at the top, kids can enjoy their very own moment of glory. 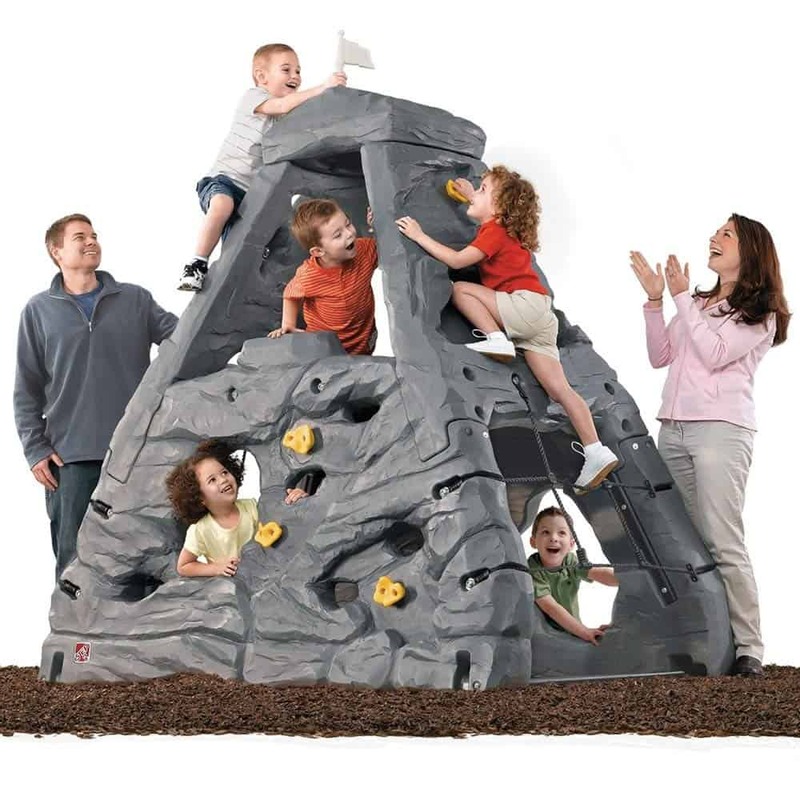 It is often believed that even the tallest mountains can be climbed and kids can certainly have their challenge in Step2’s climbing toy. For safety purposes, the Skyward Summit comes with an open-air climber peak. Kids can enjoy their safe space after a successful climb. 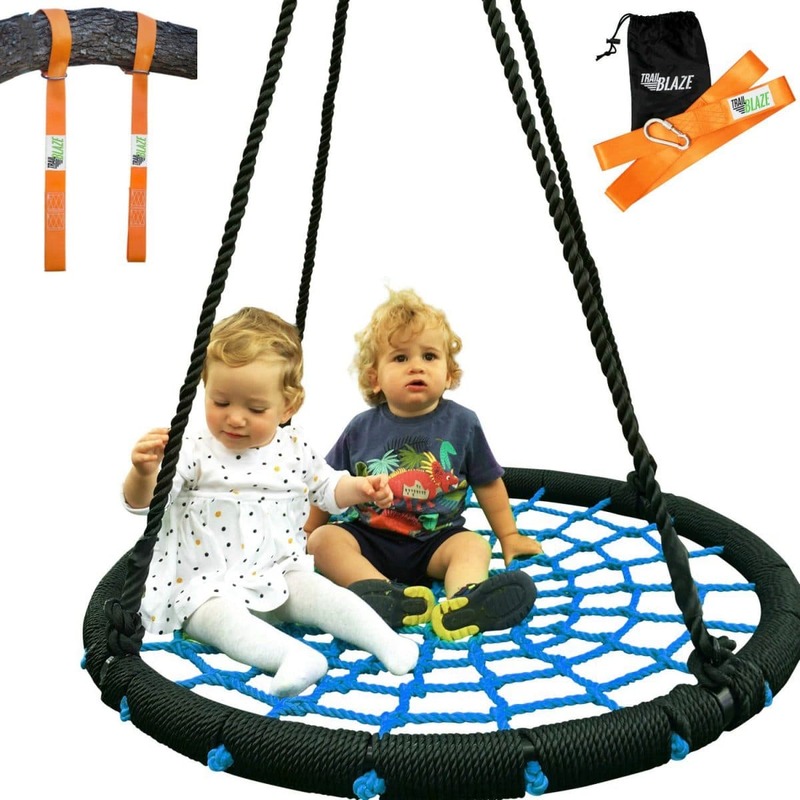 With a mid-level climbing cargo net and 12 mini grips, kids can climb the toy in different ways. Each time they attempt to climb if they can use different strategies. But since all toys are impressive when shared, the Skyward Summit can be a top attraction for when the friends are over for a visit. Why we like it: Made specifically for balance and locomotor coordination, the buckets can be used at home, at school or during therapy. Climbing and finding balance on the 6 buckets can be a simple and fun activity. Kids can use the buckets as part of their playtime routine. But the buckets also have other applications. They can be used at school in the gym class. 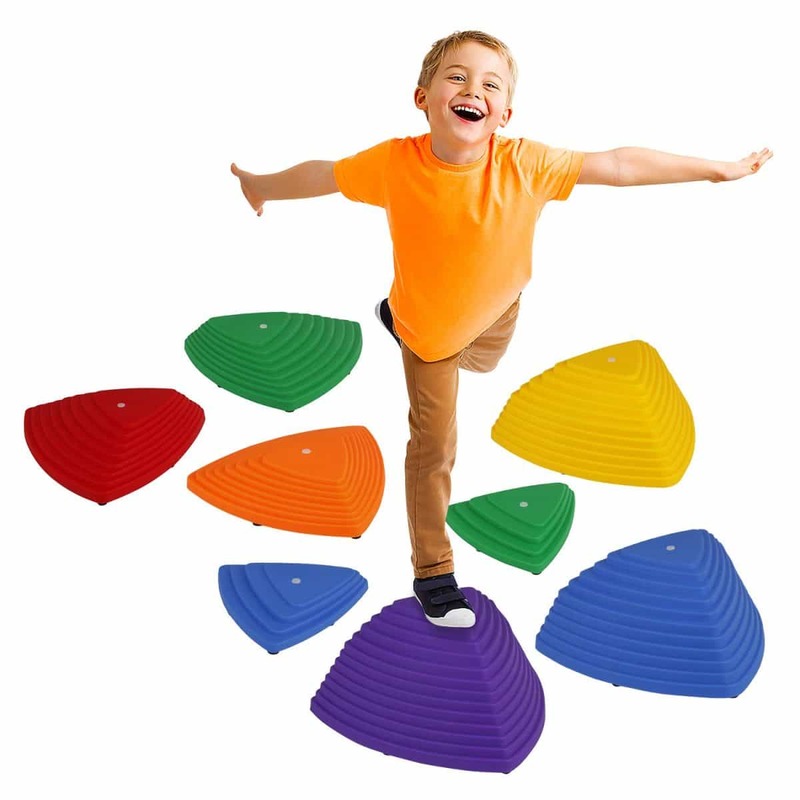 They can also be used in therapy for kids with locomotor issues. The primary role of the buckets is to improve balance. A secondary role can come with the simple primary colors which kids can learn to distinguish. Made with durable 2-ply molded plastic, the buckets are durable. They are also connected by a rope which means they are easily moved from one area of the room to another. Why we like it: With a roller coaster home experience, the Thomas the Tank Engine-inspired toys is fun for both boys and girls. 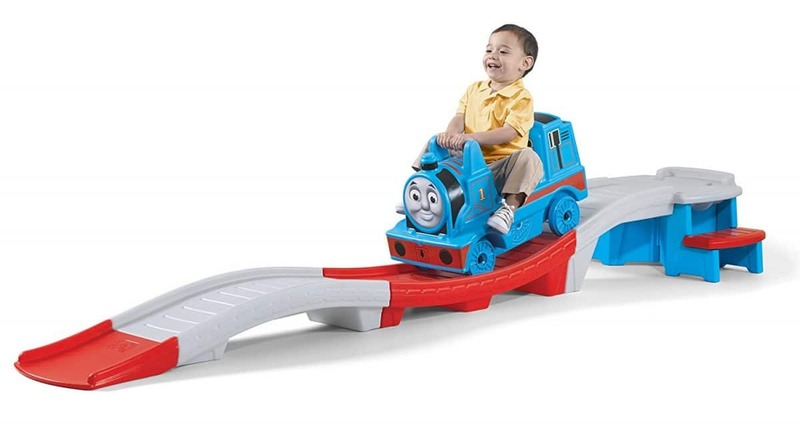 The original climbing toy is a complementary solution for Thomas the Tank Engine fans. Kids can ride their very own train in the comfort of their homes. Assembly is not complicated and the roller coaster can be installed within minutes. It allows kids to climb the train from both the left and the right side of the platform. With 9 feet of roller coasting fun, Thomas the Tank Engine can provide hours of fun for the kids. It can also be used as an attraction at birthday parties. But Thomas is only ready to take kids 2 to 5 aboard. With its authentic face, decals, and colors, Thomas is always ready for a joyful train ride. Why we like it: This versatile cargo net can be used on its own or on various climbing toys. Made with a simple design, the climbing cargo net can be all that’s needed to improve kids’ climbing skills. It comes as one of the best designs to improve strength and coordination. Even its weight limit is larger than what most climbing toys can handle so kids of various ages can consider it. With a maximum weight limit of 150lbs, the cargo net can be installed inside or outside the home. At a size of 30in X 96in, the cargo climbing net can be installed on walls or on climbing toys. Some parents prefer to even install it on trees. Apart from improving strength and coordination, the climbing net is fun to use. Kids can climb it taking turns and enjoying hours of harmless fun. Why we like it: This unique design can certainly represent an inspired gift idea. Kids and even adults can enjoy their minutes of fun with the skateboard tree swing. 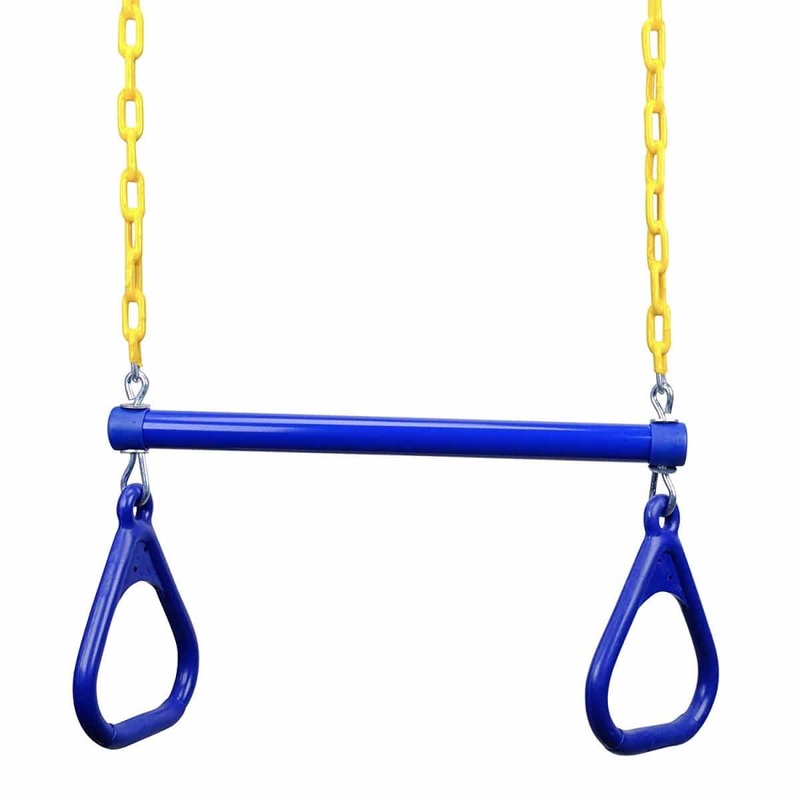 Challenging the classic swing stereotypes, this toy can actually benefit children in more ways. Since they don’t sit on it, kids can have their own workout with the swing. Improving coordination and the strength of the leg muscles, kids can use the tree swing as a fun solution to have better balance. Apart from its unique design, the skateboard-style swing also comes with a unique manufacturing process. Each wooden piece is sanded by hand which gives it an elegant and unique look. Apart from its unique design and manufacturing, the tree swing can also be installed on various trees or even around the house for maximum fun versatility. Why we like it: With a foldable design, this kid-friendly slide is even recommended for indoor use. It’s always worth to invest in foldable large slides. 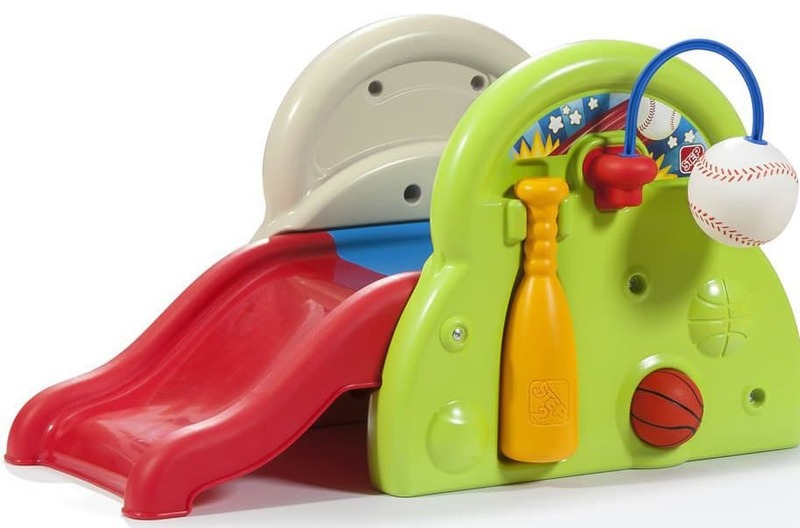 They provide the sliding fun kids are so in love with while also coming with a design which allows easy storage. Most parents can appreciate its space-saving design as kids might not want to slide every day. With a 110lbs weight capacity, this slide works perfectly for kids and toddlers looking to have their own fun or fun with friends. 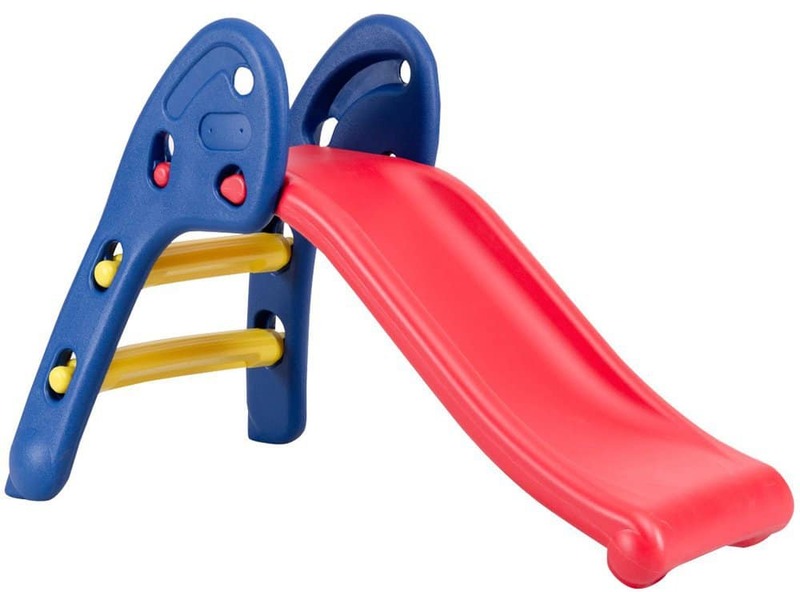 Since its made from plastic, the fast slide is also lightweight. At its 9lbs, it can be moved from the living room to the bedroom and even outdoors if the weather is right. From a safety perspective, the slide is very stable. 20-month old toddlers can climb it on their own. There are only three mini steps for them to climb. Apart from sliding fun, the toy can challenge their balance and strength as well. Why we like it: This wooden-made playground is recommended for indoor use and even for apartments. Based on a foldable design, the playground can actually be based in smaller homes and apartments. It comes with all that’s a need to entertain kids multiple times per week. But even if it comes with a foldable design, it doesn’t mean it can’t actually be store away. Since it folds perfectly flat, it saves space and it can be installed only when truly needed. There are a few characteristics which find this playground actually replacing multiple climbing toys. From a Swedish ladder to a climbing net and from a slide to a drawing board, the playground offers kids plenty of play versatility. Its main role is to improve balance and coordination. But the included drawing board can also boost creativity and educational benefits. Some parents might be concerned about weight handling. But the playground actually takes up to 130lbs with no damages to its structure. Kids can feel confident it can hold their weight as a result. Why we like it: With a soft construction, the foam blocks are recommended to stimulate motor development in toddlers. With a soft stable structure, the foam blocks represent one of the most simple and efficient challenges to boost kids motor development. Simply placed in their room on the floor can invite toddlers to crawl. In terms of actual safety, there are no reasons to worry about. The blocks are stable and they represent a simple solution for protection with added foam padding. Cleaning the blocks is easy as well as they are covered in faux leather. The 6 blocks are highly durable. It is why the manufacturer covers them with a 5-year warranty. But one of the interesting characteristics for parents to consider comes with their space-saving design as the blocks can be stored as a tower. 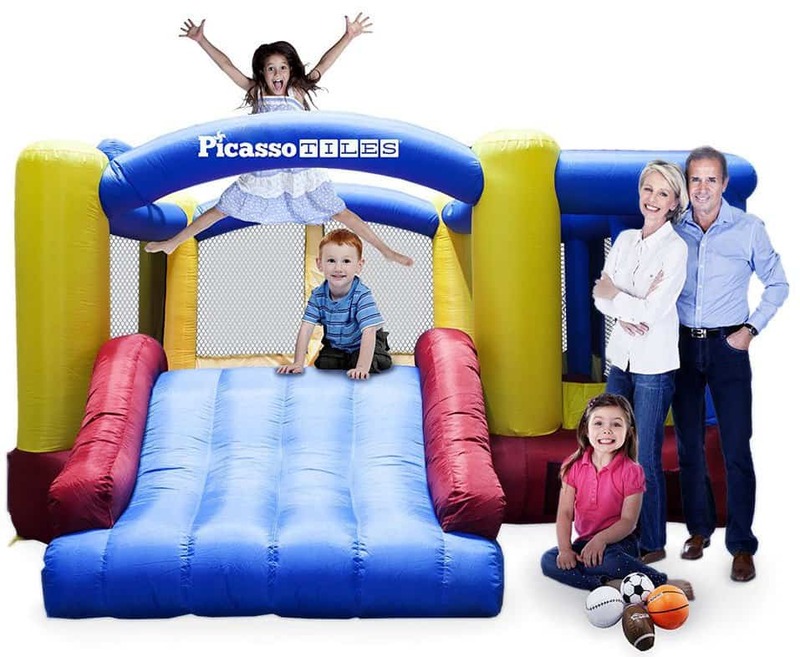 Why we like it: With inflatable fun bouncing, the climbing playhouse can be a hit a children’s parties. The inflatable playhouse is one of the most impressive gift ideas. 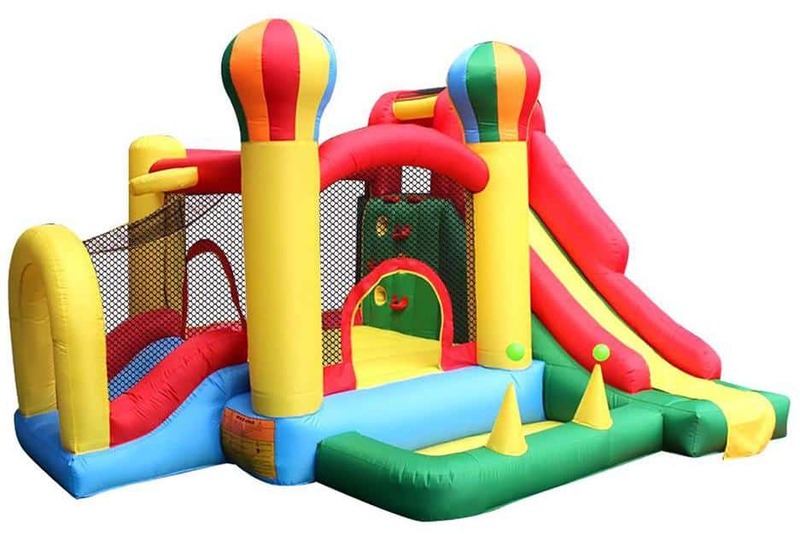 Parents actually consider such attractions for various parties but they can also be installed in the backyard for kids to bounce on every day. With an inflatable climber and two inflatable sliders, the playhouse can offer hours of fun. Made from fire-resistant and puncture-resistant materials, the playhouse is perfect for outdoor use. 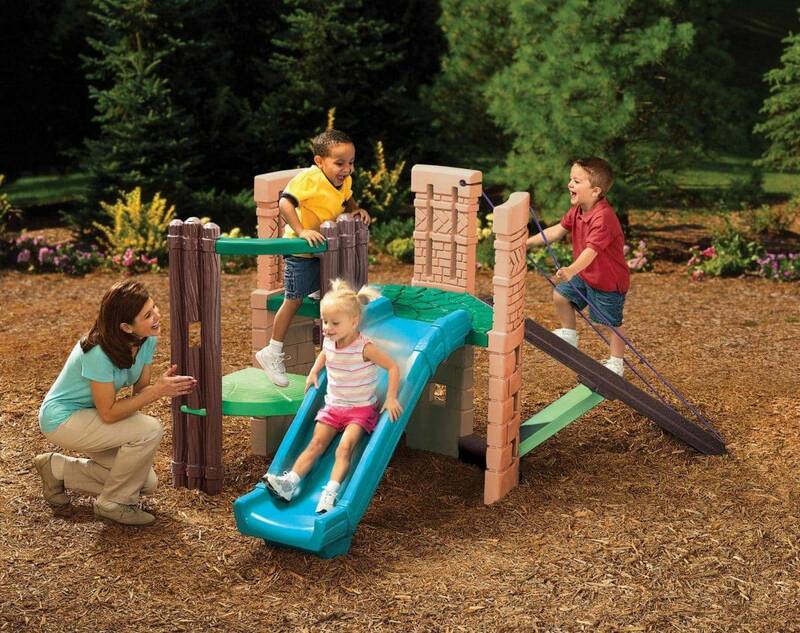 Why we like it: With US-made construction quality, the Adventure Playset offers toddlers endless fun possibilities. Made to be climbed and crawled on, the Adventure Playset is among the interesting toys to consider for in-home use. It comes with various blocks and a wedge for climbing. At the same time, a tunnel piece is included for toddlers to crawl through. Free from chemicals, the playset can be safe to use even for toddlers of just a few months. Free from lead or phthalates, the playset can be installed in the children’s room. 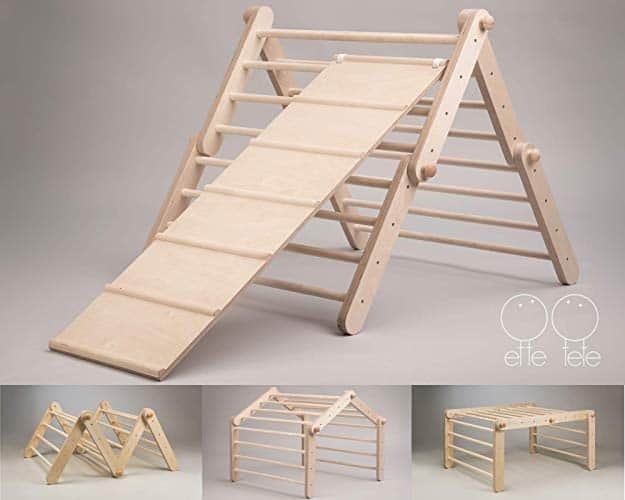 Its simple design can encourage active play and promote strength through climbing or crawling. Kids’ creativity can also benefit from various climbing strategies. Why we like it: A good trampoline remains a timeless toy for endless hours of fun outside the house. This safe trampoline can be considered by parents who value safety and fun together. 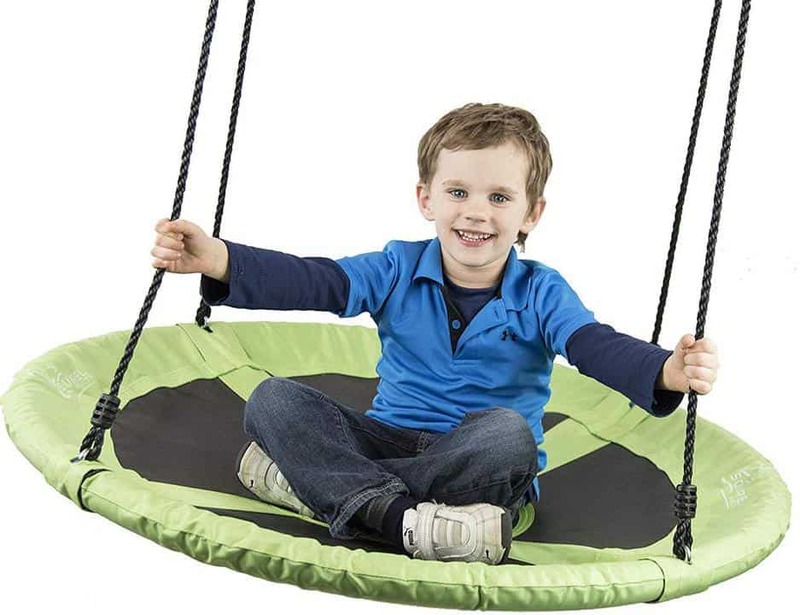 With a two-zipper design which prevents kids from falling, the trampoline is fun and safe to use. Climbing it can be done from the side and it allows kids to even slide out when done jumping around. 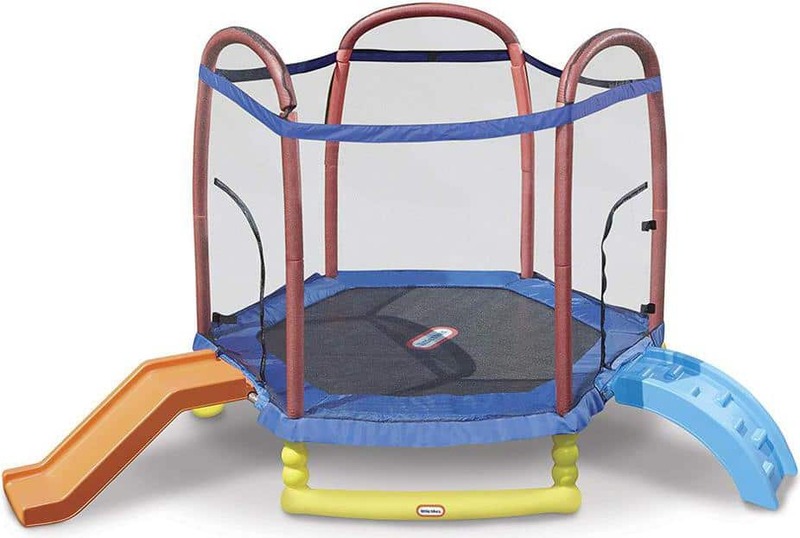 Since safety is crucial with trampolines, the Little Tikes’ design comes with covered springs and covered metal parts. Made with a plastic frame, the trampoline is also easy to install even by a single adult. Most importantly, it manages to offer a fun climbing toy to be used by one or multiple kids at a time. Why we like it: As a classic swing set, it actually includes a few extra safety characteristics to make it viable for toddlers. The Toddler Swing Set can easily be installed in the yard. It doesn’t take too long to have it installed on a swing set. But the best part is it actually comes with a restraint system which keeps the child in place. This is crucial for most parents who want to replace a simple plank of wood as a swing. Its durability is impressive as well. Its ropes are made to resist water damage and they can be among the top materials when it comes to cleanliness as it can be wiped off easily. The product can also represent an inspired gift idea for babies and tots. 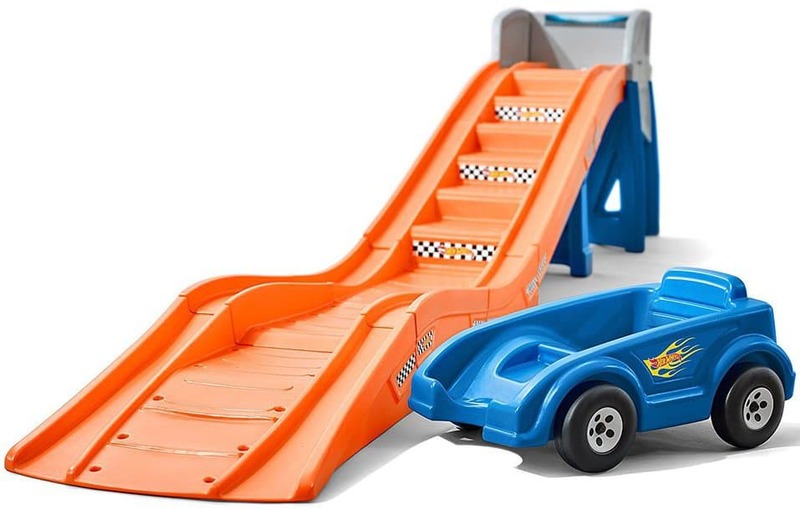 Why we like it: A Hot Wheels coaster car is a definite hit for kids who need to spend more time playing outside. The Coaster Ride On is one of the climbing toys kids can use on their own. The Coaster car is included in the set. Kids need to push it up the track using the small stairs design of the track. With 14 feet of fun rides at a time, the Coaster Ride-On is perfect for most kids of up to 75lbs. With included handgrips, the coaster car is perfect for a safe ride down the track. Most importantly, the setup can encourage kids to spend time outdoors in fresh air, far from computer screens. Why we like it: This compact toy is the perfect first inflatable bouncer for kids who want to have fun regardless of the season. With a compact size, the bouncer can easily fit inside the house. It can even work in some apartments. 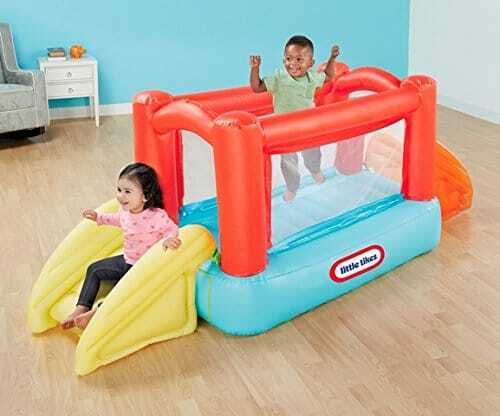 Based on its inflatable design, the bouncer can be used for hours of fun. 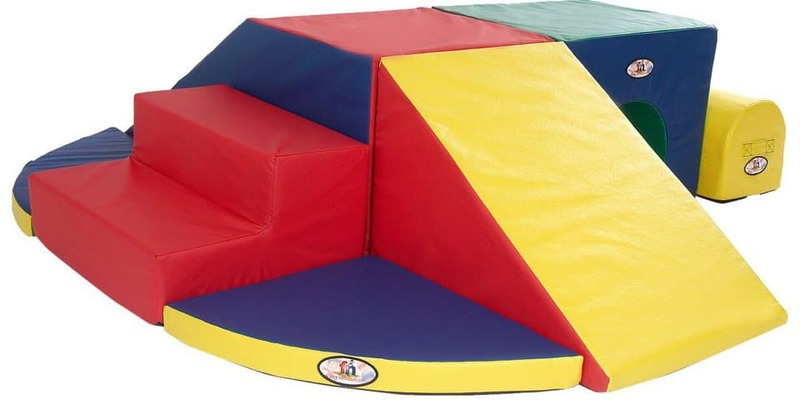 It comes with included safety nets to keep the kids inside its perimeter safely. Most importantly, the bouncer comes with its own blower which inflates and deflates it in minutes. Parents don’t need to spend more to purchase an inflation pump as a result. When it comes to capacity, the bouncer can handle up to two kids at once. Why we like it: A swing bar can be a basic climb toy to improve strength and offer instant fun. Based on an upgraded design, the swing bar now comes with materials which are made to be friendly both to the kids and to their clothes. The new S-link will not snag loose clothing. Even the chain is improved for added durability. With better coating and a 43” length, the chain can be suited for various locations around the yard. The durable reinforced handle offers instant fun options for kids. They can even play with friends and test their strength to see who can swing from the bar the longest. Kids can also leave the swing bar outside at all times as it will not get damaged by bad weather. Why we like it: Based on a powerful 525-watt blower, the bouncer can handle 3 kids or weights of up to 250lbs. As one of the most capable bouncers, PicassoTiles’ climbing playground is perfect for outdoor use. Designed with a large play area and a large inflatable swing, it allows kids to have fun at their own pace together with their friends. When they get tired of bouncing around, kids can also shoot some hoops with the included basketball hoop. One of the advantages of such a large bouncer is that it can handle more weight. With a total capacity of 250lbs or three kids, it can certainly be bounced on when friends come over or at various kids’ parties. Why we like it: As the most innovative climbing triangle, the Ette Tete design impresses with its premium quality and endless fun options. While there are many triangle-shaped climbers on the market, not many of them come with modifiable shapes. In the wooden-made world, this is quite unique. This is why it can be important to choose the products which are actually making a child’s locomotor development faster. 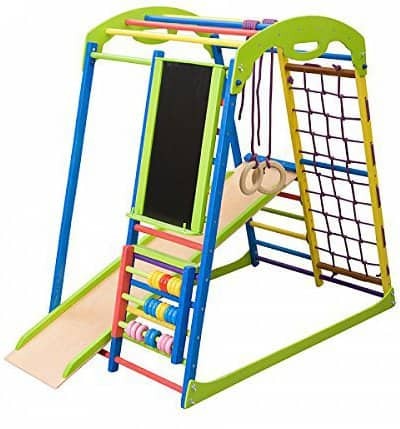 With various climbing shapes and an included wooden slide, parents can consider this premium design as one of the ultimate in-house climbing toys to get their kids active and healthy. The triangle is safe as well as it is its highest point it measures 82cm. Why we like it: This unique set comes to challenge kids for fun games with ultimate balance and control. The stepping stones mimic real stones of various sizes. 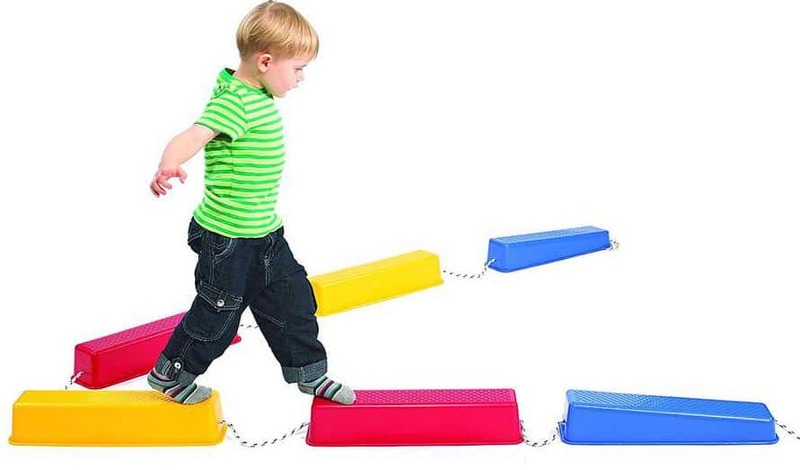 The manufacturer included 8 different stepping stones for kids to step on. There is a new grip system in place to ensure slipping doesn’t happen too easily. At the same time, kids can enjoy various games where the floor can actually be lava and where it needs to be avoided. All stepping stones come in various sizes. One extra-large, 2 large, 3 medium and 2 small river stone sizes are available in the set. The ultimate goal is to actually improve kids’ motor skills. Why we like it: A swing can be fun to use but a giant swing is even more fun and it definitely ticks the uniqueness box. The 40in swing can be one of the interesting additions to a back yard. It can be added to a jungle gym, a playset or simple hanged from a tree. 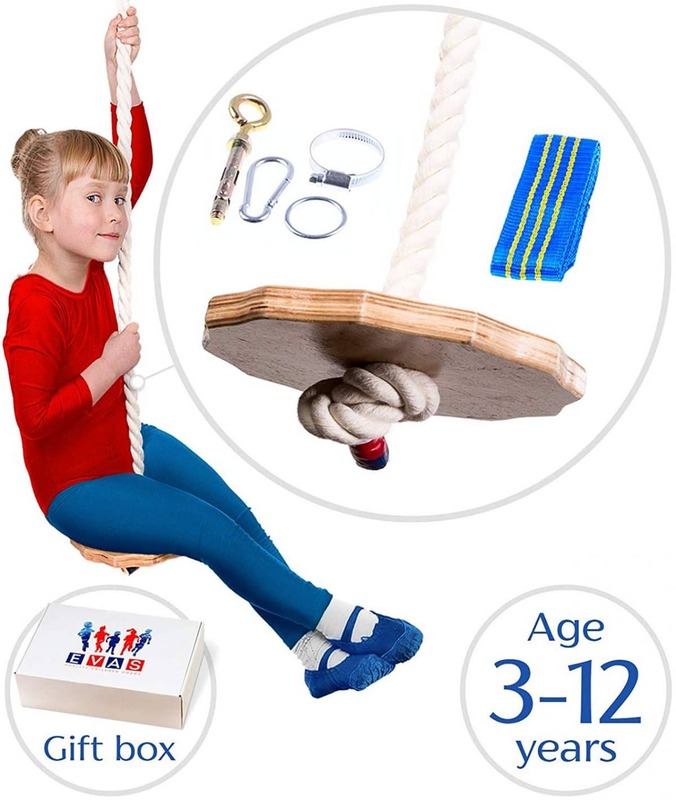 With the help of durable adjustable ropes, the swing can easily be placed higher or lower to suit the kids for fun time. 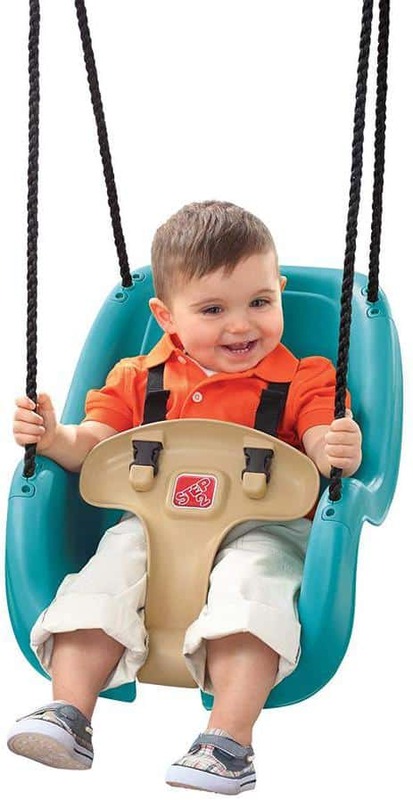 Up to four kids or 200lbs of combined weight are easily handled by the swing at all times. Why we like it: With 6 bright logs, kids can climb, walk and improve coordination while playing in groups. The simple log design of the set can be a fun way of improving coordination. Kids can walk on the logs on their own or together with their friends to improve social skills as well. Each platform comes with a ribbed design to ensure plenty of traction. Why we like it: This organic swing can be one of the environmentally-friendly options for hours of swinging fun. 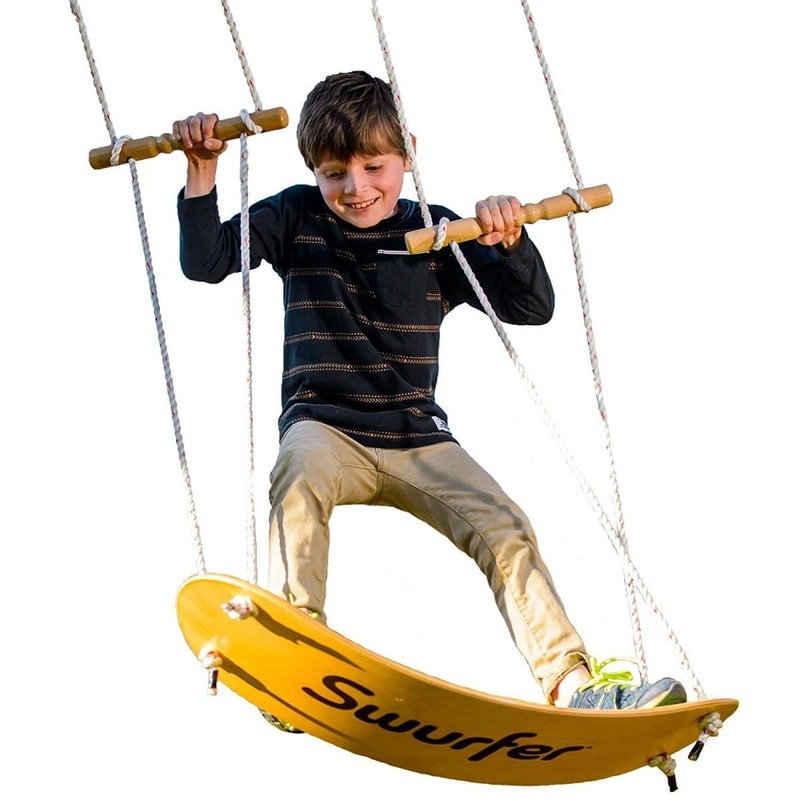 Based on a round wooden disk, kids can swing on their own. Installed in the backyard, the swing impresses with its quality. Even the rope is made from pure cotton. All kids between the ages of 3 and 15 can use it for endless fun out in the sun. Why we like it: This foldable swing is mainly recommended for its increased weight capacity of 600lbs. Swinging with brothers and sisters can be fun for most kids. The swing comes with an impressive weight capacity for its minimalistic design. Even more, its foldable design allows parents to easily store it away when not in use. The swing ships with everything needed for installation which includes 2 straps and carabiners. Some of the best climbing toys for kids and toddlers can be used both inside and outside. The toys are known for their durability which can’t be said about many other toys. But kids only care about how they make them feel and luckily, many of these climbing toys are fun to use. At the same time, their benefits can include better locomotor development, improved imagination and even better social skills when friends can be involved. Copyright © 2018 Littleonemag DMCA.com Protection Status Disclaimer: Clicking the device names or check price buttons will redirect you to the product listing on the appropriate Amazon.com (.co.uk, .de, etc. ), where you can find the updated prices, customer reviews and more product details.